"We Carry Just About Everything For Your Garage Doors"
Take The Guesswork Out Of Parking In A Garage ! Park Perfectly Every Time ! STOP GUARDS™ are the perfect solution for preventing vehicle and property damage in your garage. STOP GUARDS™ take the guesswork out of parking in your garage. Eliminate running into bicycles, lawn equipment, walls and belongings forever. Never worry about the garage door coming down on your car or van again. 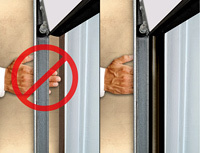 STOP GUARDS™ help ensure proper room for safe wheelchair operation. The most practical purchase for your garage, STOP GUARDS™ are durable, high quality vinyl and install in minutes with industrial-strength adhesive (provided). Rid your garage of unsightly and dangerous makeshift solutions today ! • Comes with full two-year warranty. • Prevent damage to garage or carport due to distance miscalculations when parking. • Allows for assessing adequate clearance when closing the garage door. • Helps prevent drivers from relying solely on their vision. • Ideal for judging distances needed for proper wheelchair operation. • Resistant to oil, gas, antifreeze and other chemical substances commonly found in garage environments. • Works with any size vehicle. • Won't crack, move or shatter despite temperature extremes. • Rubber material for, strength, durability and easy installation. TRACK GUARDS are the latest innovation in a continuing effort to improve garage door safety. 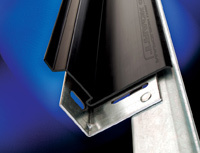 Installing Track Guards greatly reduces the chance of injury by limiting finger access between the jamb and track. Designed for new and existing 7' and 8' doors. Fits firmly over rails with clearance for bolts and wall mounting hardware. Made of a durable, lightweight nylon composite to withstand years of use and extreme temperatures. This offers an upgrade to any garage. ADDED SAFETY with the leading edge of the Track Guard snapping firmly into place providing an added measure of protection by forming a tight seal between the jamb and the track, effectively reducing the chance of injury. The Track Guard is a timely and cost effective solution as well as an aesthetically pleasing addition to any garage at a time when homeowners are paying more attention to safety and visual appeal in their homes. Track Guard is light, durable and takes only minutes to install on new or pre-existing doors with a few nails or screws. We have always been committed and active in providing you with products and innovative technologies. So while others are only selling parts, we are offering our customers safety and visual appeal for less than you or they would expect. • Comes with five-year warranty. • Call us to find out more about this simple yet superior solution. • We recommend that all extension springs utilize a safety containment cable. prevent broken spring from flying loose causing damage or injury. the other end is looped with a swedged aluminum sleeve. • Extension spring containment cables are required in California. • Galvanized Carbon Steel Cable (GAC type 7 X 7). • Galvanized hardware to resist rust and moisture. Garage Doors And Parts will assume no responsibility for the use or interpretation of this document by you or anyone. Select the placement from Figures A, B, or C (see below) that best suits your individual situation. STOP GUARDS™ can be installed in front or in back of the car's wheels. Figure A will allow the maximum width (24") and should be used for each car in doublewide garages. Put car in desired location in your garage, carport, driveway, etc. Place STOP GUARD™ as shown in the figure you choose: A, B or C. To the best of your ability, draw a pencil line around the STOP GUARD™, and then remove it. Move your car out of the way. Place the STOP GUARD™ back in place and finish drawing the pencil lines around it. When you are finished, remove the STOP GUARD™. Make sure the floor is swept clean. To ensure proper adhesion, temperature should be at 40° F or above. Then apply a 1/8" bead of adhesive, as shown in Figure D.
Place STOP GUARD™ within the pencil lines and press into place. Gently apply pressure in order to spread the adhesive. Allow 24 hours before driving over or against STOP GUARD™.